I’m pretty fortunate to have been working permanent part-time for the past 4 years (since having kids). My colleagues joke that every weekend is a “long weekend” for me, however those of you with energetic kids (esp 2 boys aged 4 & nearly 3!) will attest to, it ain’t no holiday. 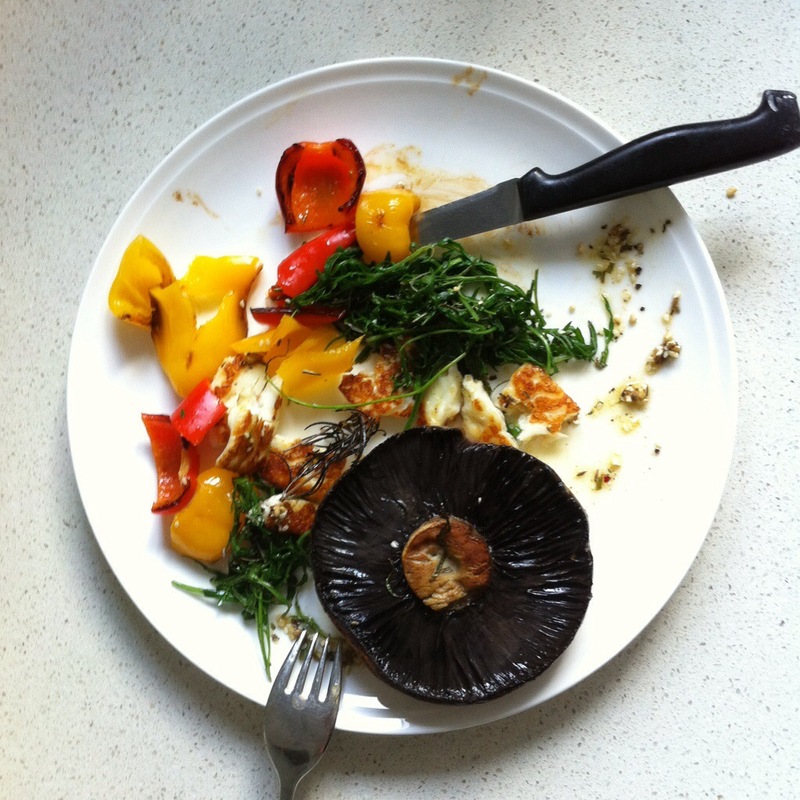 Today however I decided to pretend it was still the weekend & cooked up this vego feast for me, myself & I.
I try to balance the flavours of my meal – earthiness of mushrooms, saltiness of haloumi, peppery rocket & sweet baby peppers all work really well together. **about a week ago in a jar I combined 2 tspns dukkah, 1/4 cup olive oil, a pinch of chilli & 1 sprig of rosemary – it has been marinating nicely & can be used on so many things. I assume everyone reading this has some cooking knowledge so I don’t go into too much detail such as reminding you to turn on the stove. Fry the haloumi, peppers, mushrooms in a pan (or in a pan each if you prefer). Once you remove them, throw in the rocket for about 30 seconds til wilted. 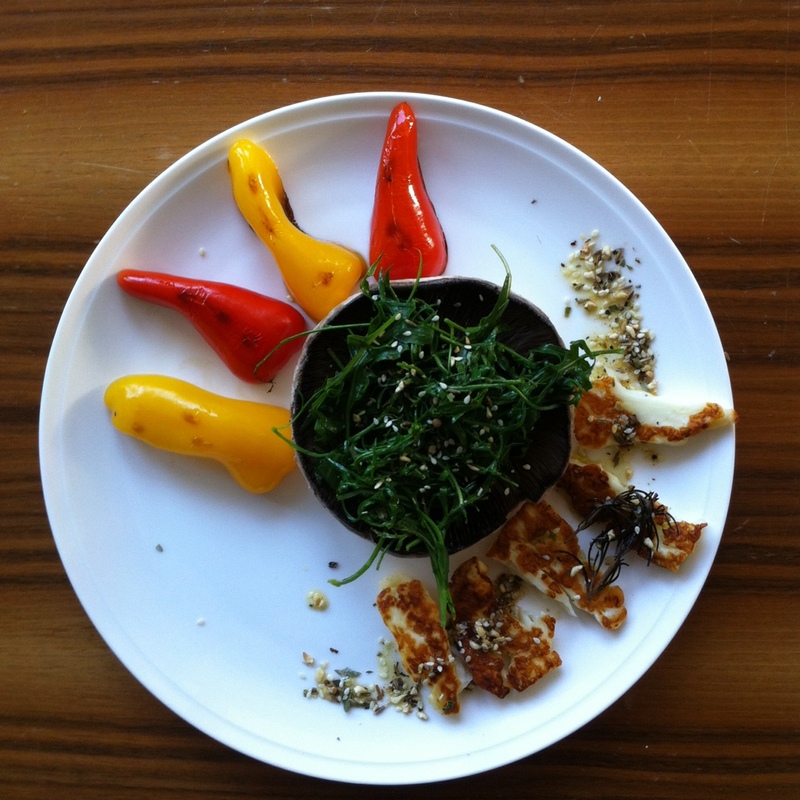 This entry was posted in Recipe and tagged glutenfree, haloumi, iqs, mushroom, peppers, refinedsugarfree, rocket, vegetarian by 6 Clean Ingredients. Bookmark the permalink.